Black-hole merger pinpointed with record accuracy by the LIGO and Virgo observatories. One of the arms of Virgo, a gravitational-wave observatory near Pisa, Italy. Physicists have announced their fourth-ever detection of gravitational waves, and the first such discovery made together by observatories in Europe and the United States. The Virgo observatory near Pisa, Italy, has been hunting for ripples in the fabric of space-time since 2007. But it was being upgraded at the time of the historic first detection of gravitational waves by the twin laboratories of Virgo’s US cousin, the Advanced Laser Interferometer Gravitational-Wave Observatory (LIGO), and was also out of action for two subsequent sightings. Virgo rejoined the hunt this year on 1 August, following a 5-year, €23-million (US$27-million) upgrade. And on 14 August, both it and LIGO picked up the gravitational vibrations emanating from a pair of rotating black holes, with masses of 31 and 25 times that of the Sun, as they merged together, physicists announced on 27 September at a press conference in Turin, Italy. The collision happened around 540 million parsecs (1.8 billion light years) away. Observing the event with three detectors, rather than LIGO’s two, allowed researchers to dramatically increase the accuracy with which they can pinpoint the location and distance of the merging black holes. A simulation of the black holes colliding. For the Virgo team that has spent more than 20 years working on the project, the sighting is vindication that the time and effort was worth it. “It’s a big event for me,” says Alain Brillet, a physicist at the University of the Côte d'Azur in Nice, France who co-founded Virgo. He began lobbying to build a European gravitational wave detector in 1980, and is now about to retire. “It’s very nice to become sure that you have not worked for nothing,” he says. “We have credibility. At least we can show that we make promises and we can deliver on our promises,” adds Jo van den Brand, a physicist at the VU University Amsterdam and spokesperson for the Virgo Collaboration. This year's observation run ended on 25 August, and now both observatories are working on upgrades that should double their sensitivity. “This is just the beginning of observations with the network enabled by Virgo and LIGO working together. With the next observing run planned for late 2018, we can expect such detections weekly or even more often,” says David Shoemaker, a physicist at the Massachusetts Institute of Technology in Cambridge and spokesperson for the LIGO collaboration. Named GW170814, after the day it was detected, the wave arrived first at LIGO’s station in Livingston, Louisiana, as a ripple in space-time that subtly shifted the relative lengths of two arms of the detector as it passed. Just eight milliseconds afterward, the same wave swept past LIGO’s second detector in Hanford, Washington, before arriving at Virgo six milliseconds later. With three detectors, physicists can be more precise about the wave's origin than was possible before. On the basis of the time that Earth’s detectors received the signal, the teams triangulated the likely location of the source, whittling it down to a patch of sky that, as seen from Earth, appears about 300 times the size of the full Moon. That region is more than 10 times smaller than LIGO has managed to pinpoint for its previous sightings. Having three detectors also enables researchers to make a rough measurement of the wave’s polarization — a property that describes how the wave propagates through space in three dimensions. This meant physicists could test a prediction made by Albert Einstein’s theory of relativity, which, besides predicting gravitational waves, also implies that such waves should stretch and contract space in planes that lie at right angles to each other. The data from GW170814 seem to support this, Frédérique Marion, a physicist at the Laboratory of Particle Physics in Annecy-Le-Vieux, France and member of the Virgo Collaboration, told journalists at the press conference. “This was the first opportunity to check this fundamental property of gravitational waves,” she said. The same polarization measurement also indicates how the black holes’ orbital plane (the plane on which they rotate around each other) is orientated with respect to Earth. Because this angle dictates how much gravitational-wave energy is emitted in Earth’s direction, combining polarization with other data allowed researchers to derive a more precise estimate of total energy released by the event and so reduce the error in their distance estimate. A paper describing their findings has been accepted for publication in Physical Review Letters. 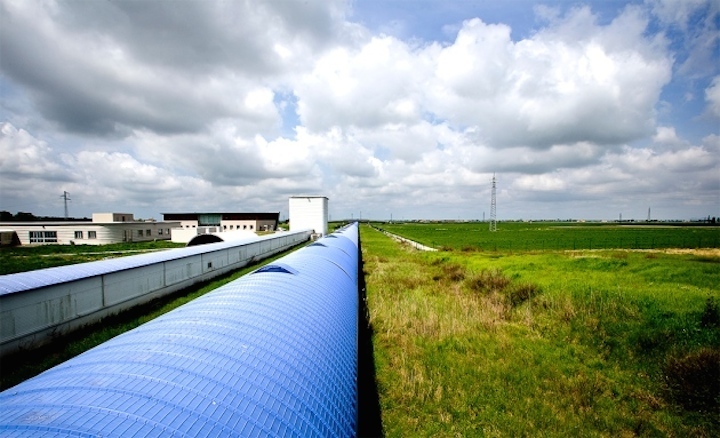 Precisely targeting the origin of a gravitational-wave signal is a significant step forward, says van den Brand. Some events — such as a collision of two neutron stars — are expected to produce such ripples and could emit a wide range of other kinds of radiation as well. If telescopes could be trained to look in precisely the right place after such a detection, they could spot this, and help astronomers to learn much more about the cataclysmic events. Some 25 telescopes raced to observe the patch of sky after the latest sighting, but none saw any kind of electromagnetic radiation coming from the event. No such signals would be expected from colliding black holes, however. Simultaneously ‘seeing’ a neutron-star collision with conventional telescopes and ‘hearing’ it through the vibrations of gravitational waves would mark a new era of astronomy. Last month, rumours swelled that the LIGO and Virgo teams might already have seen colliding neutron stars: telescopes are known to have been trained on a specific patch of sky after being alerted to another potential gravitational-wave detection. But the collaborations have yet to confirm what, if anything, their observatories saw.